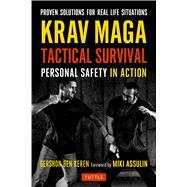 Gershon Ben Keren is an author and fifth-degree black belt who has been a student of Krav Maga since 1994. He has been trained by some of the Israeli Defense Forces' most experienced and respected Krav Maga instructors. He was inducted into the Museum of Israeli Martial Arts in 2011. In addition to his work in the security sector, he has taught Krav Maga to civilians, security personnel, law enforcement agencies, and elite military units and special forces. Ben Keren's educational focus on the psychology of violence informs his reality-based self-defense training. His fighting techniques combine firsthand observations of violence with the latest academic research. He lives and teaches Krav Maga in Boston, where he runs Krav Maga Yashir Boston.